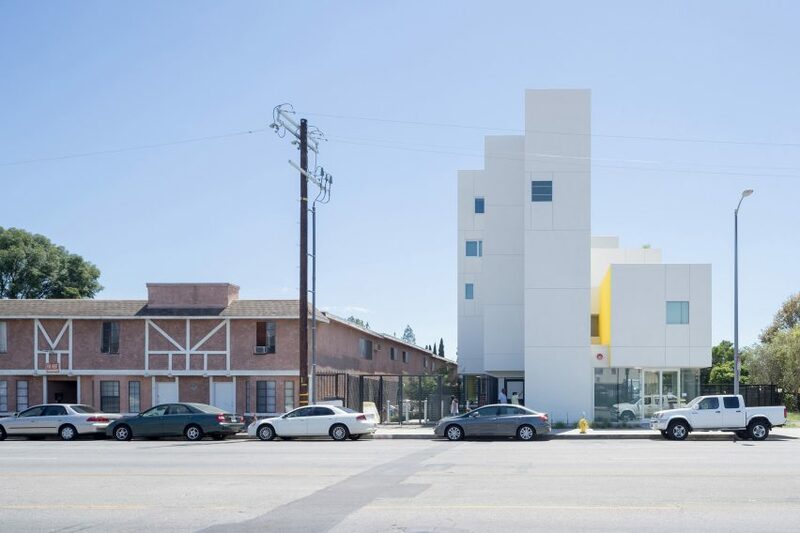 American studio Michael Maltzan Architecture has completed a bright white residential complex in the Los Angeles area, which contains over 60 studio apartments and various support services for its formerly homeless tenants. Crest Apartments was built on a slender, rectangular parcel in Van Nuys – a suburban district northwest of Downtown LA. Totalling 45,000 square feet (4,180 square metres), the complex serves as permanent supportive housing for those who formerly had no home. 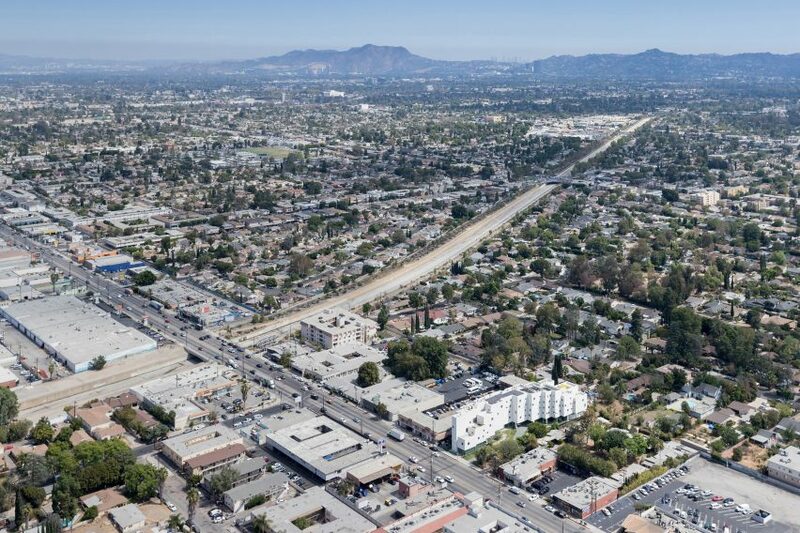 The project was backed by Skid Row Housing Trust – a local developer and property manager that provides housing for people suffering from homelessness, extreme poverty, illness, disabilities and addiction. This is the fourth residential project that LA-based Michael Maltzan Architecture has designed for the organisation. The five-storey Crest building appears to rise high above its low-scale neighbours. Rather than a simple block, the design team conceived an assemblage of rectilinear volumes that vary in height as they march across the elongated site. The complex has an “arching form”, with portions of the building lifted up and supported by pilotis. “The low points of the building touch down at both the front and back of the site, creating a physical relationship to the smaller-scale single-family residences to the south, and the commercial facades to the north,” said Michael Maltzan Architecture in a project description. Facades are sheathed in white stucco and punctuated with square windows. Splashes of colour were incorporated throughout the complex, from bright green columns to lemon-hued walls. Within the building, one finds “inviting, light-filled spaces” designed to help engender a sense of community. The ground level contains a series of communal areas and support services. A lobby is located in the front of the building, where glazed walls engage the streetscape and create a welcoming atmosphere. Behind the lobby, the team placed an array of amenity spaces, such as a lounge, a laundry room and a community kitchen. Support services for tenants, including four counselling offices, are situated in the rear of the ground level. The upper four storeys of the building contain a total of 64 studio apartments, 23 of which are set aside for homeless military veterans. Open-air corridors bring in daylight and enable cross-ventilation, while also offering views of the city. 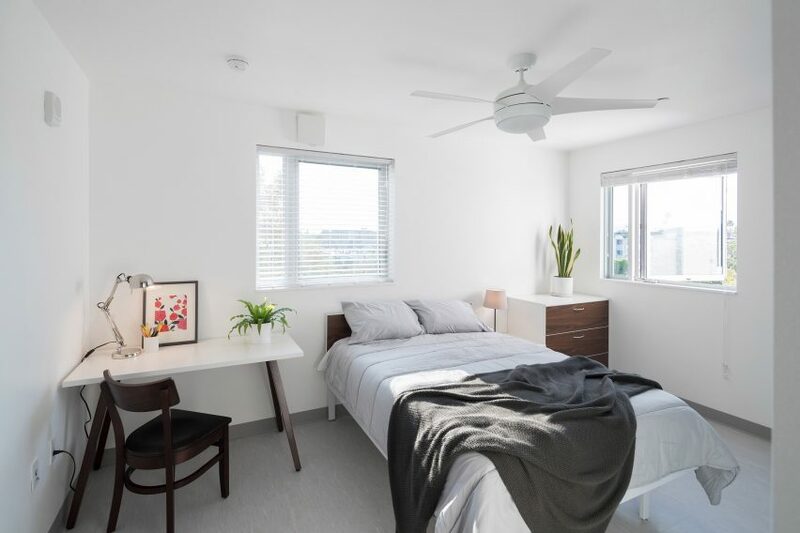 Rooms feature white walls, grey flooring and contemporary decor. The site’s landscaping is meant to play a central role in the overall design. Given the region’s limited rainfall, the team selected native plants that can tolerate drought. Tufts of grass encircle the building, and also pass underneath it. “The ground-level landscape runs across the site, spreading beyond its boundaries, creating a unified field beneath the residential floors which hover above,” the studio said. The team got creative when it came to addressing strict parking and fire-lane requirements. Rather than covering a large swath of the property with concrete or asphalt, they installed pervious pavers, which permit grasses to sprout and enable rainwater to penetrate the earth. The west side of the complex provides enough room for emergency vehicles, while also serving as green space for residents. 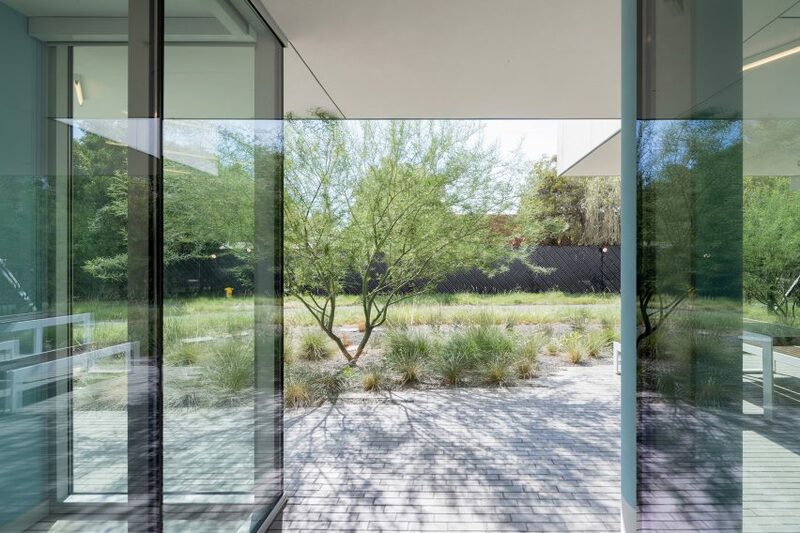 “By integrating landscape materials, such as permeable pavers that can withstand various loads, the demarcation between hardscape, softscape and functional requirements are blurred to create an interchangeable ground surface,” the studio said. The greenery helped the project earn LEED for Homes Platinum certification from the US Green Building Council. Other sustainable design elements include rooftop solar panels and high-efficiency fixtures and appliances. According to the architecture firm, the building’s energy performance exceeds the state mandate by 21 per cent. The total project cost was $23.6 million (£17.7 million), with $14.2 million (£10.7 million) spent on construction. With over 134,000 homeless residents, California has the largest homeless population of any state in the US, according to the US Interagency Council on Homelessness. 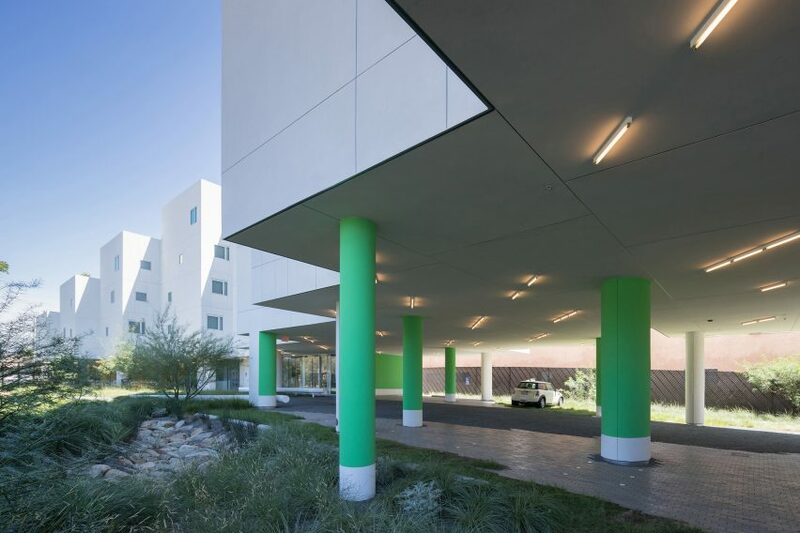 Other projects aimed at helping the homeless include The Six in Los Angeles by Brooks + Scarpa, which was also developed by Skid Row Housing Trust. The five-storey apartment building is located in the dense neighbourhood of MacArthur Park. 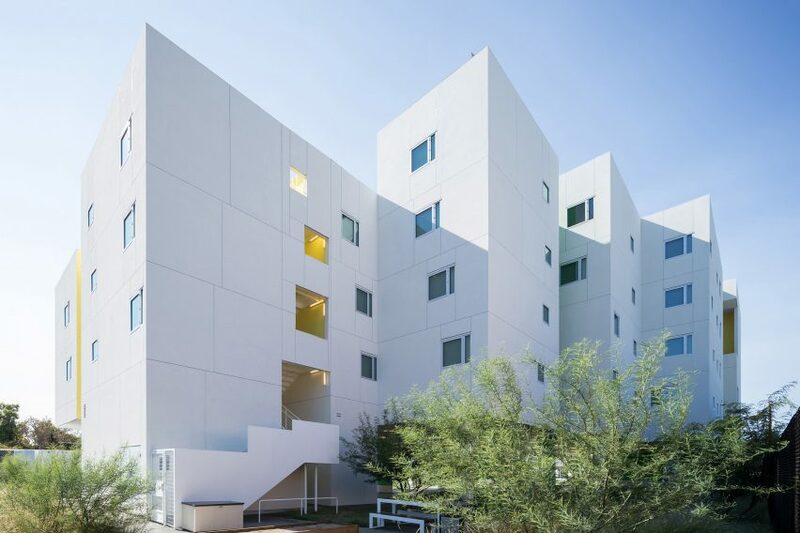 Crest Apartments was recently lauded in the AIA 2018 Housing Awards, alongside ten other residential projects across North America. Photography is by Iwan Baan for Michael Maltzan Architecture.